Did illegally gotten Iranian money, funneled through the Koch Brothers help Joe Miller in his 2010 Alaska GOP primary win over Sen. Lisa Murkowski? An upcoming story in Bloomberg's November edition indicates that this may have been possible. The story broke early today at the Euro-American Palincentric blog, Politicalgates, and was later picked up by Salon and now - 17 hours later - by Huffington Post. This is Pulitzer-Prize territory. This article is destined to make large waves, not just because of the particular revelations, but also because of the highly impressive and almost surprising depth of reporting. It is obvious that no expense was spared for this article. 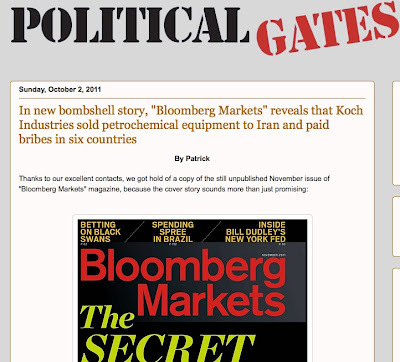 Next to Jane Mayer's ground breaking piece about the Koch Brothers in the New Yorker, this article by Bloomberg Markets Magazine undoubtedly represents another PR-disaster for the Koch Brothers, and could also have severe consequences. - The story also covers in great detail over several pages earlier violations of Koch Industries: The company in the past "rigged prices with competitors, lied to regulators and repeatedly run afoul of environmental regulations, resulting in five criminal convictions since 1999 in the U.S. and Canada"
• Will implications from the article have an impact on the Flint Hills Refinery in North Pole? 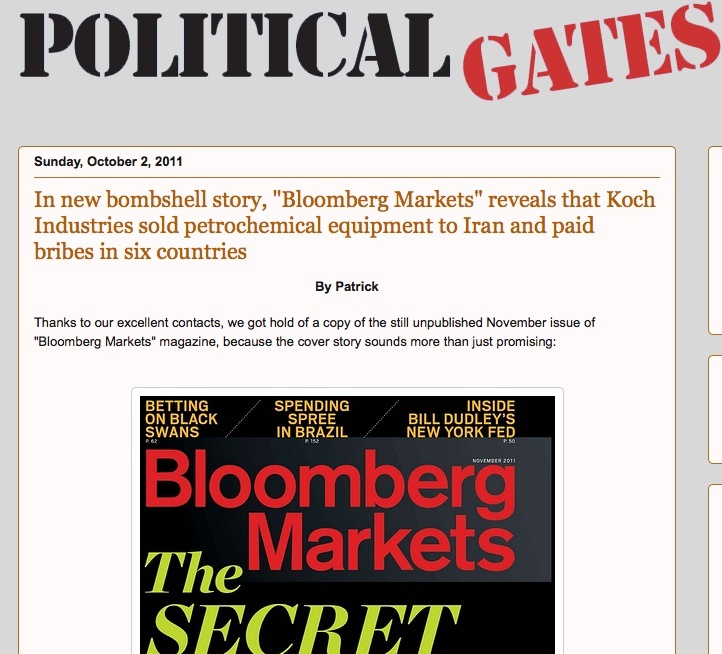 • Should we scrutinize how money makes it way from Iran to the Kochs to Alaska candidates? • Should we press GOP politicians who have gotten money funneled to them from Koch organizations and employees to give it back? • Should we pressure Tea Party movement groups who have affiliated with Americans for Prosperity to return all the funds they have received from groups affiliated with or benefitting from Koch funds in any way? • Should we make sure that no bills pending in the Alaska Legislature are tainted with possible spinoff funds from the Iranian deals cooked up by the Kochs? Thank you very much, Phil! We really appreciate it! It's so much fun to have a scoop. 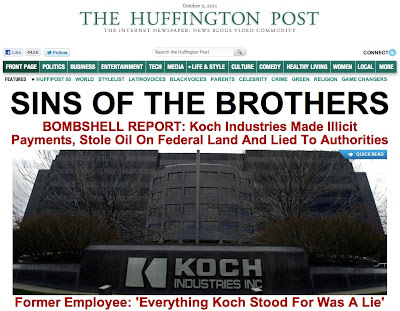 Hopefully the story by Bloomberg will have severe consequences for the Koch Brothers. 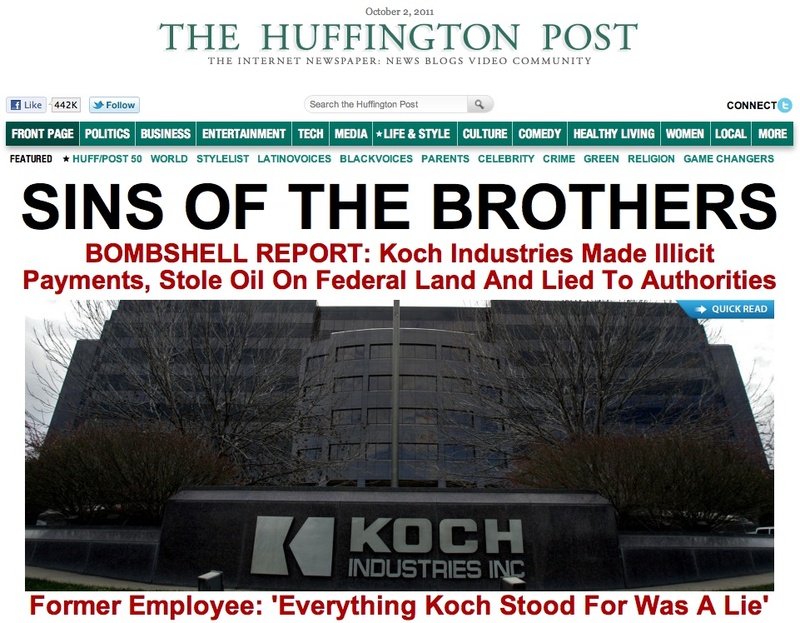 "Hopefully the story by Bloomberg will have severe consequences for the Koch Brothers." --- When Bill Allen gets out of detention, that room will be available. 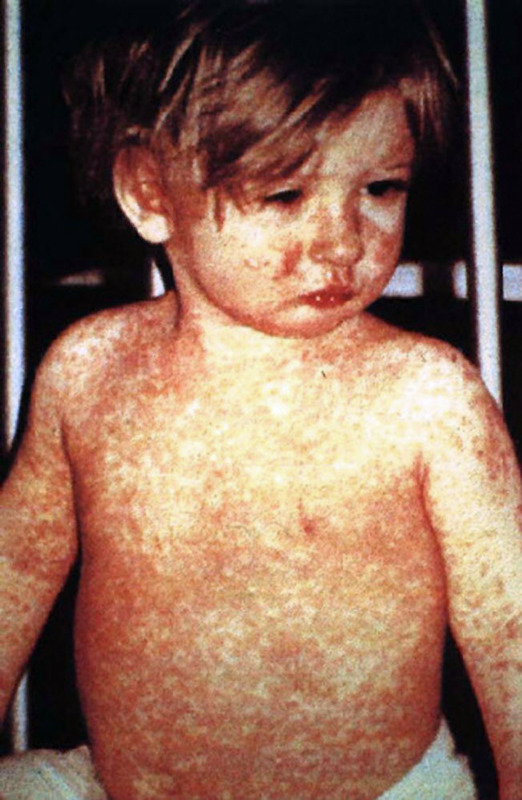 Phil, do you think Alaskans will listen to this story with more attention than they did to the lies of Sarah Palin? It takes Arianna a little longer to call out her rich Republican buddies. I'm sure she only posted this as a sort of "damage control" so she couldn't be accused of being one of the elitists that won't post real news; news that actually pulls the covers off the wealthy cabal that actually runs the country and the world. Too late, too little Arianna. HuffPo is a joke and has been since its inception. Back in September 2008 someone from HuffPo emailed me, asking to write for them, about Palin. He or she wrote that HuffPo was "prestigious." I wrote back that I already was writing occasionally for firedoglake and that was prestigious enough for me. WICHITA, Kan. -- Koch Industries Inc.'s subsidiary Flint Hill Resources announced Thursday that it will buy Huntsman Corp.'s chemical and polymer business in the United States in a $761 million deal. The purchase includes manufacturing plants in Port Arthur, Odessa and Longview, Texas; Peru, Ill.; and Marysville, Mich.
About 900 employees are working at those plants, and the company expects to add between 20 to 30 jobs in Wichita. "This acquisition will allow Flint Hills Resources to grow its existing chemical production business and to build on our operations and marketing capabilities worldwide," Flint Hills spokesman Marc Palazzo said. "We see this as a natural extension of our current business." Flint Hills Resources, the Wichita-based subsidiary of Koch Industries, is a producer of fuels and other petrochemical products with refineries in Alaska, Minnesota and Texas as well as a chemical plant near Joliet, Ill. If it receives regulatory approval, it would be the largest acquisition in Flint Hills Resources' history. The agreement does not include Huntsman's captive ethylene unit in Port Neches, Texas, home of the company's Performance Products division. Under the deal, Flint Hills will acquire manufacturing assets of Huntsman's U.S. commodities business for $456 million in cash and the value of the Dec. 31 inventory of $286 million. Huntsman will keep its accounts receivable and payable and certain accrued liabilities of $19 million. Every time I see that picture of the Koch brothers, I am reminded of the two latently-homosexual siblings in "Trading Places": Randolph and Mortimer Duke. Phil, thank you for turning down Huff Post, I quit reading and commenting there many months ago. Arianna is a joke and a bad one at that. Thank you for bringing truth to the table, it is really needed in this messed up world.